Because we’ve created a monster that’s bent on ruining the content marketing that was once the saving grace in our long journey toward self-destruction. “There is a content monster, and it’s tearing apart content marketing. You know what’s even scarier? We’ve got a once-in-a-lifetime opportunity to turn things around. If what Seth Godin said about content marketing being the only marketing we have left is true, we’d better grab it. Artificial intelligence is here, and it might pull content marketing back from the brink of destruction — if we’ll just let it. 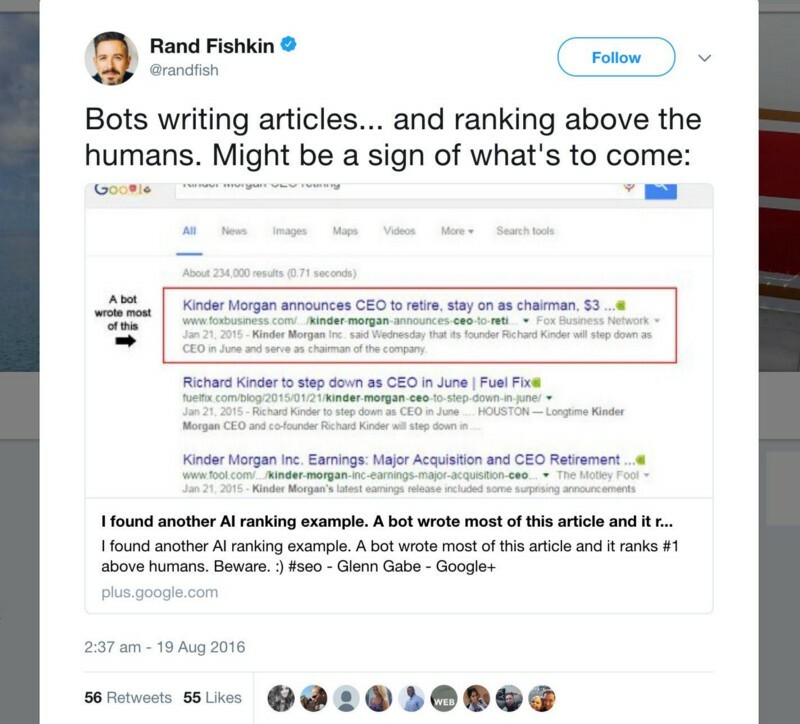 When I say AI will save content marketing, you might jump at the thought of getting some of your most time-consuming tasks — like that whole writing thing — off your plate. Quality content isn’t something that can be completely automated just yet. But it can be augmented. Some chatbots are already smart enough to put tons of relevant data at our fingertips as quickly as we’re able to make a query. Engadget mixed a million words and a few rules to create a “Blogbot” that spit out a complete, though drab, tech announcement. These current limitations might actually be a good thing, considering that a deluge of content isn’t exactly working. “Content volume is important. Enterprise organizations need lots of content in many different forms and multiple channels. “Machines will help us produce content. Machines will suggest assets to include in the content you’re making, or subsets of content to include. Executive control will remain with creators, but the ideation and production process will become increasingly automated. While that dream isn’t yet fully realized, a shape is starting to form that looks a lot like a life raft rescuing us from drowning in content. If there’s one thing AI excels in over humankind, it’s making sense of data. Then the whole cycle starts over again with smart recommendations on which topics your audience is interested in based on how they’ve interacted with your content. An AI-enabled platform allows you to serve the perfect content and products throughout a user’s experience, increasing the likelihood of a conversion while keeping the churn rate low. I like to think we haven’t done things completely wrong as content marketers. Maybe we’ve done too good of a job. Artificial intelligence isn’t replacing content marketers, it’s working alongside us. Let’s see a machine do that.